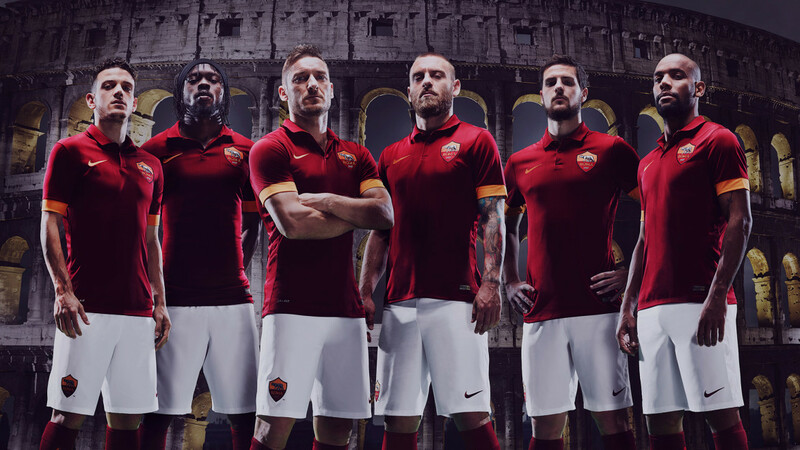 Starting on season 2014-15 the new partnership between AS Roma and Nike has been announced with the public presentation of Roma home and away kits. The kit features a classic and typically sharp design. The body is in Roma red and features a drop-needle tonal stripe throughout offering players the very latest in performance innovation, kit technology and environmental sustainability. Sartoria was in charge of the creative direction and executive production for the shooting of the iconic group shot by photographer Gianni Troilo, which features key-players Totti, De Rossi, Destro, Florenzi, Gervinho and Maicon in front of the Coliseum.